Home » Austin » Hamilton Pool » nature » Texas » Hamilton Pool, near Austin, Texas. An ideal weekend getaway, Hamilton Pool Preserve is one of the most beautiful best swimming holes in Texas. The historic preserve's pool and grotto were formed thousands of years ago when the dome of an underground river collapsed due to severe erosion. 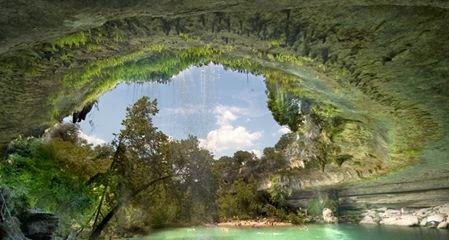 Hamilton Pool is fed by the Pedernales River and is home to wildlife such as turtles and fish. Hamilton pool stands out as one of the best places to swim in the area, as it boasts a gorgeous 45-foot waterfall that spills out from a limestone dome that hangs over the pool. In addition to swimming, the 232-acre nature preserve is a great place to enjoy a picnic or and explore the native beauty of Central Texas’ along its nature trails. Guided tours are also available. Hamilton Pool is located 30 miles southwest of Austin off of Highway 71, and is open daily from 9am to 5pm.